Located in rural South Carolina, just off the Cherokee Foothills National Scenic Byway, the Red Horse Inn (www.theredhorseinn.com, 864-895-4968) is the perfect place to get away from it all. Surrounded by pastures and woodlands, this Landrum property is run by two savvy innkeepers who know how to provide those little extra touches, yet also give their guests a heaping helping of privacy. 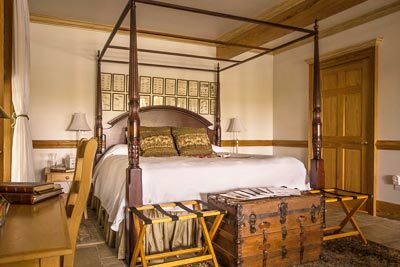 Access is good at this 12-room country inn, with barrier-free access through the Gathering Room to the accessible East Bedroom. The first-floor room features wide doorways, plenty of room to maneuver a wheelchair, and nearby accessible parking. The room is furnished with a 30-inch high king-sized bed, and a sofa with a 16-inch high fold-out bed. 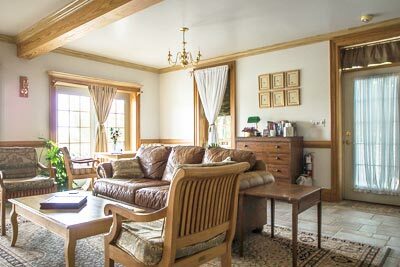 There is also a large fireplace and a private terrace with a great view of the adjacent pasture. The terrace has wide French doors and a small step, but it can be easily accessed from the outside. It’s a great place to sip a glass of wine and enjoy a romantic sunset. 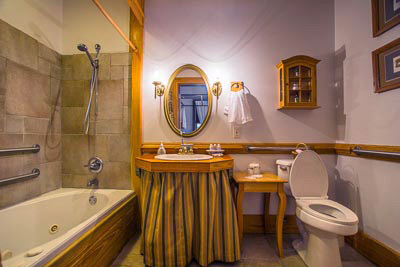 The bathroom is equipped with a whirlpool tub with a built-in bench, grab bars and a hand-held showerhead. The toilet grab bars are located on the left and back walls (as seated), and the spacious bathroom also has a roll-under sink. Breakfast is a very private affair at the Red Horse Inn, with all the makings provided in built-in kitchen closets in each room. The menu includes coffee, a fruit parfait, an egg casserole, juice, oatmeal and some very yummy muffins. Trust me, you won’t go away hungry. A microwave and a refrigerator are also included in each kitchen closet; and when you’re done with breakfast, everything folds up neatly out of the way. Innkeeper Mary Wolters can also make arrangements for a romantic in-room dinner, with advance notice. A word of warning, don’t use GPS in this area, as it will most likely lead you astray. Stick to good old fashioned maps and directions. Save some time to take a romantic drive on Cherokee Foothills National Scenic Byway (Highway 11) while you’re in the area. Mary is happy to map out the historic bridges along the way. Campbell’s Covered Bridge is the closest one, located on Highway 414. There’s one accessible parking place on a cement slab near the bridge, with a paved pathway down to the bridge. 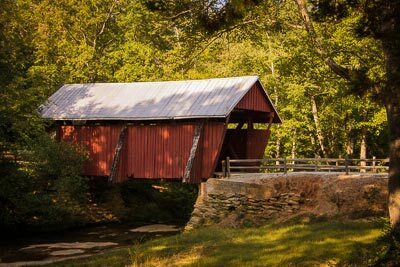 Built in 1909, this 35-foot bridge that crosses Beaverdam Creek was named for Alexander Lafayette Campbell, who owned the local grist mill. Although there are two steps up to the bridge itself, you can still get a good view of it all from the end of the pathway. To continue along on your historic bridge tour, backtrack on Highway 414, go north on Highway 14 to Gowensville, then take Highway 11 west. 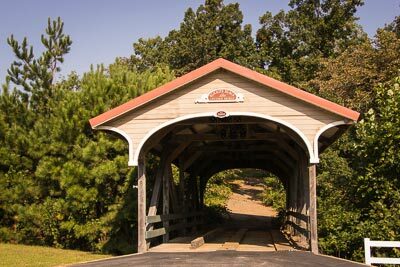 A few miles down the road you’ll find the Klickety-Klack Covered Bridge, at the entrance to Look Away Farm. Named for the sounds the timbers make when vehicles drive over them, this refurbished bridge is level and easy to walk over. There’s no real parking area, so just pull over close to the bridge and check it out. The last bridge — Pointsett’s Bridge — dates back to the 19th century. From the Klickety-Klack Bridge, continue west on Highway 11, take a right on State Road H912, then travel a few miles and turn right on Calahan Mountain Road. The bridge is located on the right, just past the Boy Scout camp, but the parking area is located across the street. 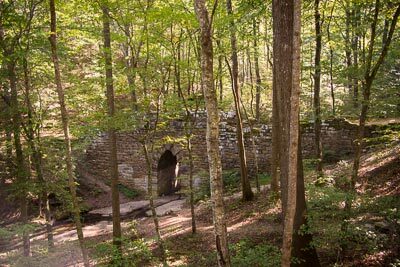 This stone bridge crosses Little Gap Creek at the beginning of the old toll road to Charleston. You can’t drive over the bridge any more, but you can get a great view it from Calahan Mountain Road. If all this driving has worked up your appetite, then continue along Highway 11 to Cleveland for a romantic lunch at Victoria Valley Vineyards (864-878-5307, www.victoriavalleyvineyards.com). Styled after a French chateau, the tasting room features level access and an accessible restroom. They also have intimate cafe that serves a light lunch menu of appetizers, salads, sandwiches and desserts. And if you’re not hungry, then enjoy a little wine on the terrace overlooking the vineyard. Either way, it’s the perfect end to a very romantic getaway.